Exactly 40 years ago the Vietnamese burst into Saigon, catching the Americans in their underpants. As well as mounting a brave defence of their country, the Vietnamese used one superpower’s firepower to defeat another. To get a sense of how viciously the Vietnam War was fought and – more importantly – the sweeping nature of Vietnamese victory, chew on this: during the conflict the Americans lost more than 2,000 aircraft; the Vietnamese lost just 131 planes. This astounding record notched up by the Vietnamese against a superpower with virtually unlimited military resources – and which could also count on combat support from allies such as Australia, South Korea and New Zealand – was possible because of the almost superhuman fight put by the Vietnamese military and civilians. The war began in 1954 and ended with a Vietnamese victory on April 30, 1975. For this resounding victory the people of Vietnam did not just make tremendous sacrifices; they made those sacrifices count. The Vietnamese leadership evacuated entire cities (600,000 of Hanoi’s 800,000 civilians moved out from the city to the countryside and mountains); children went to school with leaves attached to their shoulders as camouflage from aerial attacks; transport trucks hid by day in the jungles and moved at night guided by lights hung under their chassis. Vietnamese engineers invented submersible bridges which could not be seen from the air. They also developed a complex network of tunnels – some of them passing right under American-held areas – to move troops, food, fuel, civilians and the injured. They made each bullet count. On December 22, 1972 a Vietnamese anti-aircraft unit using a single-barrel 14.7 mm gun shot down an F-111 supersonic fighter-bomber. What was remarkable was the anti-aircraft gun had only 19 shells left when they spotted the American aircraft. While Vietnamese morale, patriotism, superior training and the belief that theirs was a just cause were clearly critical factors, the victory was also due to the virtually ceaseless flow of weapons from Russia. During the 1950s and early 1960s, Moscow had employed a hands-off policy towards the conflict in Southeast Asia. Premier Nikita Khrushchev, for instance, wanted to avoid yet another nuclear standoff as had happened in 1962 in Cuba. But his successors Alexey Kosygin and Leonid Brezhnev wanted to please the hardliners in the Soviet military and consequently ramped up military aid. By the spring of 1967, a river of aid was flowing from Russia into North Vietnam. By the late 1960s more than three-quarters of the military and technical equipment received by North Vietnam was coming from Moscow. Sergei Blagov writes in Asia Times that Moscow contributed weapons essential to North Vietnamese defence capabilities against the American air war, including radar systems, anti-aircraft artillery, surface-to-air missiles (SAMs). “Without this materiel, Vietnamese air defence would have been hardly feasible,” he says. Russia military supplies completely transformed the nature of the war. Unlike what they show you in Hollywood movies, the Vietnamese did not fight with just cunning and camouflage, they hit the Americans with firepower on a staggering scale. Their arsenal included 2,000 tanks, 7,000 artillery guns, over 5,000 anti-aircraft guns and 158 surface-to-air rocket launchers. The new weapons – although not the latest in Moscow’s arsenal – were more advanced than the American ones, leading to many battlefield routs of US military forces. American aircraft ran into skies streaking with SAMs and thick with ack-ack salvoes. Entire waves of American aircraft were blasted out of the skies because the Vietnamese fired ceaseless barrages of SAMs, knowing more Russian supplies were on their way. “In August 1965, the first SAMs were fired at four F-4 Phantoms over Vietnam, shooting down three. This marked the first time that US planes were attacked by SAMs,” writes Blagov. Jets that survived these brutal knockouts were picked out by Vietnamese Air Force aces flying MiG-17s and MiG-21s; these combat aircraft were vectored towards their targets by Russian-supplied radars. To give you an idea of just what the Vietnamese were up against, in 1965 just 30 MiGs were doing combat against 660 American aircraft. And yet the Americans lost 46 F-4 fighters, of which 13 were downed by MiGs. The odds were evened soon. In 1966 the Vietnamese Air Force started receiving the latest MiG-21 interceptor. On July 7, two MiG-21s shot down an F-105 with a Russian Atoll air-to-air missile, creating panic in the US Air Force. By now the Vietnamese pilots were growing more familiar with their Russian jets. Roger Boniface writes in MIGs Over North Vietnam: “The MiG-17 pilots started to indulge in dogfights with American aircraft; the former were growing in confidence all the time as they could constantly turn inside the faster F-4s and use their cannon to lethal effect from close range. The MiG-21 would use their superior speed and dive on the Americans from higher altitudes. 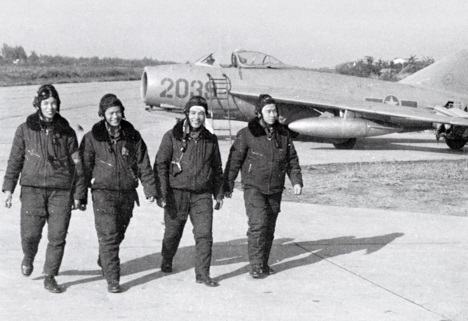 The VPAF would use both the MiG-17 and MiG-21 against the Americans, using their techniques in unison by catching the Americans in what can only be described as a diving and turning “sandwich”. The American pilots became so scared of encountering the Vietnamese air aces that they in several cases they fled the scene of combat at full speed. Early warning by Russian military intelligence saved countless Vietnamese lives. Truong Nhu Tang, a senior North Vietnamese official, writes in A Viet Cong Memoir that Russian ships in the South China Sea gave vital early warnings to Vietnamese forces. Russian ships would pick up American B-52 bombers flying from Okinawa and Guam. Their airspeed and direction would be noted and then relayed to Vietnamese political and military headquarters. The Vietnamese would then calculate the bombing target and vector their fighters into attack trajectories. These advance warning gave them time to move out of the way of the bombers and while the bombing runs caused extensive damage, because of the early warnings from 1968-1970 they did not kill a single military or civilian leader in the headquarter complexes. Russia also supplied Vietnam with medical supplies, food, oil, machinery and spare parts. And unlike the material and weapons supplied by China – which demanded deferred payment – most Russian assistance was supplied as aid rather than loans. Over the course of the war the money donated to the Vietnamese cause was equal to $2 million a day. In late March 1965, Brezhnev announced that his government had been receiving "many applications" from Soviet citizens offering to serve as volunteers in Vietnam. However, Russian freelancers were not really needed. From July 1965 to the end of 1974, around 6,500 officers and generals, as well as more than 4,500 soldiers and sergeants of the Russian armed forces visited the country as ‘advisors’. In addition, Russian military schools and academies trained more than 10,000 Vietnamese military personnel. Just 13 Soviet citizens lost their lives in the entire conflict, says Eko Planety. On the ground the picture was grimmer – if that was possible – for the Americans. The Vietnam War was the first conflict in history in which assault rifles were used by both sides on an extensive scale. Vietnamese soldiers were fortunate to get that era’s most advanced rifle – the AK-47. The Kalashnikov’s lighter bullet meant each Vietnamese could carry around 350 bullets on their person, which allowed them to fight long after their opponents ran out of ammo. The rifle was also remarkably low-maintenance, translating into better performance in Vietnam’s wet and humid environment. In contrast the American infantryman was armed with the shockingly poor Colt M16, which jammed so often that newly arriving American soldiers would perform the macabre drama of walking amidst injured or dying American soldiers to grab M16s that hadn’t jammed during battle. The AK-47 vs M16 scenario was symbolic of the superior quality of Russian weaponry throughout the war. In fact, Russian weapons performed so well that the Chinese started pilfering the shiny new gear passing through their territory. Moscow was forced to use the dangerous sea route to ensure the Vietnamese got the supplies they needed to win the war. American losses would have been greater had Russia provided the Vietnamese armed forces with the latest weapons in its arsenal. For instance, the OSA class missile boats – that India had used to destroy Karachi harbour during the 1971 War – never reached Vietnamese navy. These boats armed with the highly accurate Styx missile had the potential to play havoc with the US Navy. Perhaps the brass at Moscow believed the Americans would have resorted to a nuclear strike on Vietnam had they lost one of their large capital ships such as the aircraft carrier Enterprise. Carl von Clausewitz defined war as, “an act of force to compel the enemy to do our will”. The Vietnamese generals simply refused to give the much larger American military the war it wanted. Through their brilliant strategies and sustained firepower they compelled the US to withdraw its forces and finally dump its puppet government in Saigon. On April 30, 1975 the world was treated to the sight of Vietnamese T-54 tanks bursting through the gates of the Presidential Palace in Saigon. In another part of the city, angry Vietnamese stormed the US embassy, catching the American ambassador Graham Martin virtually in his underpants. Vietnamese army units had the helicopter in which he was being evacuated in their sights but the long war was finally over and they figured it wasn’t worth adding his miserable scalp to the American toll of 58,200 dead, more than 150,000 injured and 1600 missing.